MongoDB query building doesn’t get any simpler than this. 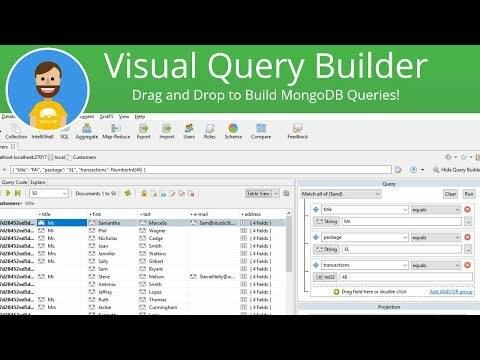 Our clever drag-and-drop builder makes it easy to construct and run MongoDB queries. Just click on the Query Builder button on the right of the window to enable, drag a document into the field, and change the operators for the perfect result. 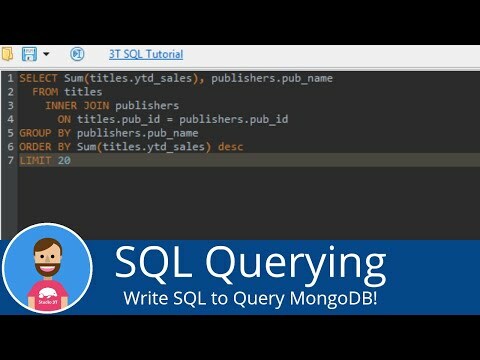 Experience the simplest way of building a MongoDB query - only on our MongoDB client. Need to make a quick change to a document? Double-click on the value and overwrite it. It’s as simple as this, taking only a few seconds. 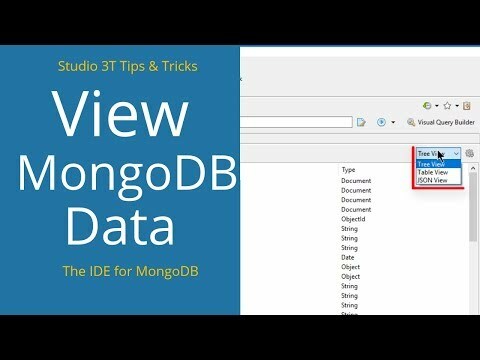 You get three ways to view your MongoDB data in Studio 3T. If you're into visualizing hierarchies, there's Tree View. If you prefer to view documents the old school way, there's JSON View with a built-in editor for real-time, lossless editing. Then there's Table View - the most powerful of all - which can handle any document size and lets you hide columns and step into cells and columns, even array-valued ones. 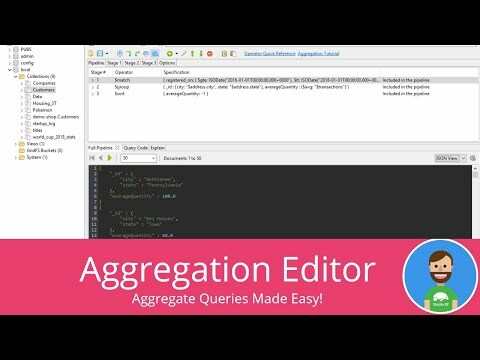 Write complex aggregate queries with greater confidence and accuracy: With Studio 3T’s Aggregation Editor, you can break down your queries into stages, allowing you to apply various pipeline operators and check your results at every step. View query plans and execution statistics stage by stage, and gather helpful information like execution times, stage outputs, and amount of data processed at a glance. Configure and save frequently-run jobs like imports and data synchronizations, so you can later execute them on demand. Take Tasks up a notch with Task Scheduler, which adds a scheduling functionality to fully automate repetitive MongoDB jobs. 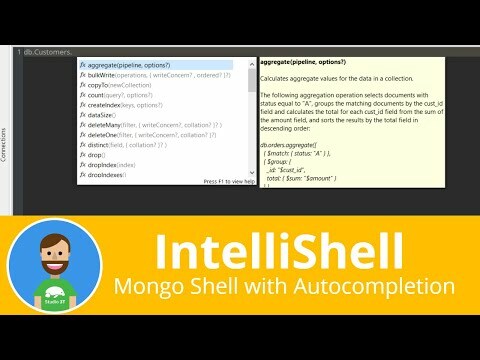 Import entire SQL databases or multiple SQL tables to a single MongoDB collection, and map table relationships (one-to-one, one-to-many) to JSON exactly as you need. Let our Import/Export Wizard do the hard work. We of course support all the major SQL databases for your convenience: Oracle, MS SQL Server, MySQL, and PostgreSQL. Available in Pro and Enterprise versions of our software. If you have a MongoDB Enterprise license, our Enterprise edition is the perfect complement. Easily deploy LDAP and Kerberos, its two supported authentication methods, while enjoying the full range of Studio 3T's advanced features. Studio 3T Enterprise users can now import Oracle to MongoDB with our Import Wizard. Simply download the Oracle JDBC driver, update the settings under the JDBC Drivers tab in Preferences, and let Studio 3T load the rest dynamically. 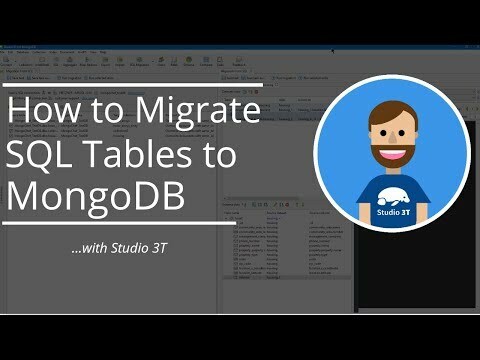 Studio 3T supports SQL import to MongoDB for all the major SQL databases: Oracle (Enterprise version only), Microsoft SQL Server, MySQL, and PostgreSQL. For the Enterprise Edition of Studio 3T a special Enterprise installer for Microsoft Windows is available. This features an MSI installer to ease deploying Studio 3T at scale within the Enterprise. Also, in this Enterprise version the auto-update feature is removed. Do you have a large team of Studio 3T users? Our Enterprise edition lets you manage license key installations through Windows Group Policies / Administrative Templates files, which are included in the Enterprise .MSI download bundle, so you don't have to bother with the hassle of tracking them manually. Skip the command line and complete your import/export tasks with Studio 3T's convenient wizard instead. In addition to SQL, JSON, CSV and BSON/mongodump formats are also supported, and you can always export entire collection(s) or view(s), current query results, and specific documents. Studio 3T makes your life easier. With just one right-click of your mouse, you can assign, for example, a red color to your live MongoDB database to ensure that you can easily differentiate between live and test databases. Worried that your MongoDB query results will get overwritten? Just click on the lock symbol as needed in the Result Tab toolbar or set your entire MongoDB connection to read-only by default, and explore query results with confidence and at ease. With Studio 3T Data Compare and Sync, you can select entire MongoDB databases, specific collections, or particular query results to compare. Run the comparison, and you’ll see the differences side-by-side, and all results can be edited and/or synchronized in place! 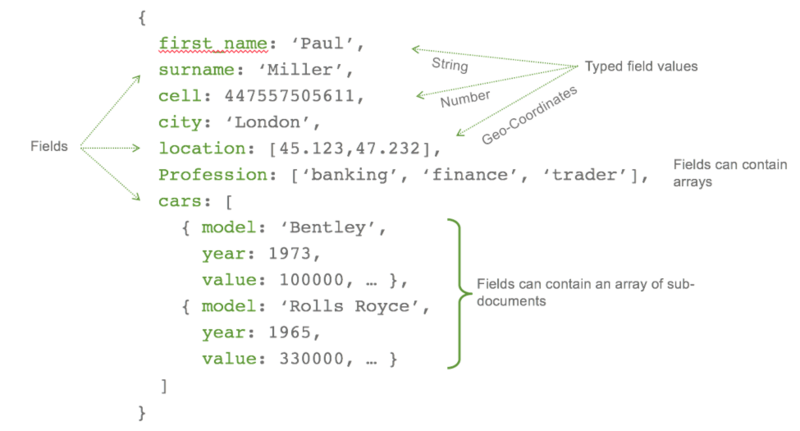 MongoDB schema discovery and exploration has never been easier! Studio 3T provides a very powerful Schema Explorer feature that lets you easily discover the schema that is present across the documents in your collection to help you find data outliers. Drilling down into individual fields, you can see, for each field, various visual statistics relevant to the data type of that field. The server status charts show real-time updates of what's happening on a MongoDB instance. Right-click on either a connection, database, or collection, and then easily customize which charts are shown. See charts such as Operation Counts, Current Connections, and Current Network Traffic, on one convenient screen. Use our superb new MapReduce screen to easily process each document and emit one or more objects for each input document. This is followed by a reduce stage that combines emitted objects from the output of the map operation. Save even more time while switching views and tabs, editing documents, executing queries, and completing other common MongoDB tasks with Studio 3T's convenient hotkeys. Here at Studio 3T, we’re always on top of MongoDB updates. With the release of MongoDB 4.0 comes a larger feature set and more flexibility. And now you can experience the benefits, as Studio 3T is fully compatible with MongoDB versions 3.0 to 4.0.